A lot of brewers think about water as the “final frontier” of the 4 main brewing ingredients. I used to think that water adjustments were just small tweaks that maybe would take a 40 point beer to a 41. Now, I think water is just as important as the other ingredients. Yes, you can make tasty beer with just about any drinkable water, but if you are going to the trouble of sourcing German Pils over American, or paying premium prices for hops like Citra, Mosaic, and Galaxy, you should go to the trouble to adjust your water for the beer you are brewing. “But why is water profile important?” you may ask. Water makes up about 90% of the beer you drink. Hops, barley, and ethanol are only about 10% of the beer you drink. So, logically it follows that the taste of that 90% matters. But it doesn’t follow from that alone that water makes a big difference in the taste of beer, because by that reasoning, good tasting water will make good tasting beer. In fact, in my experience, the water that I use for brewing certain beers actually tastes worse than the water I adjust. The main flavor salts that brewers use to adjust their water are Gypsum (CaSO4), Epsom Salt (MgSO4), Table Salt (NaCl) and Calcium Chloride (CaCl). These don’t add a lot of “great taste” to the water. So what gives? Well, the short story is that the ions that make up these minerals play important roles in beer flavor and in the chemistry of certain brewing processes. 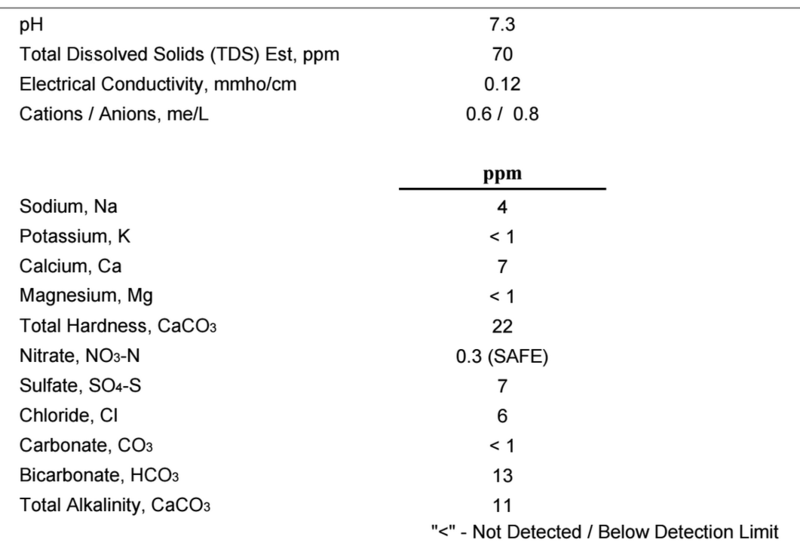 Here’s a table with some of the most important effects of these ions. If you really want to dive deep, check out Martin Brungard’s excellent Water Knowledge page. The last water chemistry property we’re concerned with is pH. Lower finished beer pH typically results in a crisper, sharper finish, while higher finished beer pH typically results in smoother finish, but sometimes at the cost of refined malt character. Additionally, high sparge pH can lead to harsh or awkward tasting tannins. But Can You Really Taste A Difference? Now you may be thinking, “Got it, I’ve read all that in How to Brew, but still doesn’t mean I should adjust my water before I seek out Canada Malting Pale Ale malt for my Tired Hands HopHands clone.” In that case, you might be interested in my friend Marshall’s experiments over at his blog Brülosophy. He’s done dozens of experiments and water chemistry is one of the only factors that he has been able to consistently show makes a difference in the flavor of the beer. Personally, having done several taste tests of my own, I can say with confidence that mineral content and pH make a huge difference in beer flavor. Yes, it’s the difference between good and great, but it’s also the difference between ‘meh’ and ‘wow’. In this great BrewUnited article, user rdc4687 indicates that water chemistry made a huge difference in his IPA’s. I totally agree, mine too. The good news is, you can adjust your water relatively cheaply and easily. You really don’t need an expensive pH meter or an RO machine. In fact, I would suggest you start manipulating your water without either of those things. Water (duh) – More specifically, you need low mineral (ion) water. Basically, water that isn’t super hard or alkaline. More on this in a moment. That’s it. Those tools can be had online for less than $40. Probably less if you can acquire some of them locally. The difficult one is the low mineral water. Here’s how to handle that. You need to know the mineral content of the water you are using. The values you are interested in are Ca, Mg, Na, Cl, SO4, Alkalinity, and pH. There are two main sources of water that the average brewer uses. Bottled and municipal tap. If you are using bottled water for your brewing water, I would highly suggest using one of the Glacier machines that sit outside most grocery stores. The water is quite cheap and you can collect it in your fermenting carboys. These machines, according to their marketing literature, involve a RO process, and therefore you should be able to treat that water as if it were RO. Due to maintenance and other factors, the water might not actually be a completely blank slate, but it should be close enough (as always, YMMV). If you can’t find a Glacier machine, or don’t want to use one, there are several other bottled water profiles listed on the Brewers Friend Water Profiles page, use one of those known brands and it’s corresponding profile. There is an RO entry on the Water profiles page you can use for Glacier machine water. If you are using municipal tap water, check with your local water company/authority and see if they provide those numbers in their annual report. If so, you’re golden. If not, you have a couple options. The first is to check the Brewers Friend Water Profiles page to see if your city is listed. If so, it’s probably close enough to use those numbers. If not, the other option is to send a water sample to Ward Labs and order the W-6 Household Minerals Test. You don’t need the Brewer’s test. The extra ions it includes aren’t worthwhile and it’s more expensive. You can order a kit, or just send a sample, order form and payment. You can just use an empty plastic 500mL water bottle as your sample container. Rinse with your brewing water as instructed, fill to the brim, then squeeze water out until it will fit in a small flat rate USPS box and cap with zero air inside. Test is $21, USPS small flat rate is $5.75. Total cost, $26.75. Cheaper if you buy postage online. When you get your report, it will look like this. There are a couple of caveats with using tap water. First, if you already know your water is really hard or alkaline, just use bottled. Don’t waste money on the test, you won’t have a good baseline for adjustments without using an expensive RO filter. These numbers would be about the maximum you could reasonably adjust without diluting with RO, which is beyond the scope of this article. Note, these numbers are not absolute, you can certainly still adjust your water with higher numbers, but you will be limited in the profiles you will be able to emulate. Second, you will need to do something about chlorine or chloramine in your tap water. Chlorine is different than chloride mentioned above. Chlorine is toxic to yeast and can cause chlorophenols which are plasticky, medicinal, and band-aid type off flavors. Not pleasant. Hopefully if you are using tap water already, you are already using a carbon filter to remove chlorine. 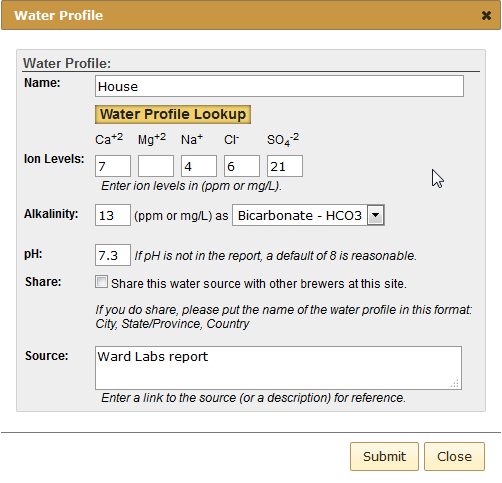 If you send your water to ward labs, take the sample from the filter just like you would for brewing. Make sure you are using the recommended flow rate as chlorine removal via carbon filtration is not instantaneous. If you are not using a carbon filter or do not want to use a carbon filter, you can remove chlorine by adding campden tablets to you water at a rate of 1 tablet per 20 gallons of water and allowing it to sit for 5 minutes. Lastly, your municipal supply might switch sources during the year, which can change your water profile suddenly. Your municipal supply’s annual report should state if this is the case. If so, you will need to learn to predict the change or inquire when it happens with your supplier and you will need at least two tests from ward labs. You may want to go the bottled/RO route if these changes are hard to predict or one of the sources is particularly hard. I highly recommend adjusting the water for a pale IPA for your first shot at adjusting water. It will result in the biggest impact and the profile is simple. SMaSH beers are also a good choice and they improve dramatically when the pH is right. It’s really difficult to get the right pH in a SMaSH without adding acid. You could use Bru’n Water to calculate your water additions, but I don’t use it, so check out BrewUnited’s and Brülosophy’s tutorials for it. For Brewers Friend, it’s really simple to just create a recipe and choose a target water profile, save it, then click the “Mash Chemistry and Brewing Water Calculator” link at the bottom of the recipe. I like to check the “Show Overall Water Summary in Each Section” box. That way you can click the “Update Calculations” button in each section and see where you are at. Remember to click that button after each of the changes you make in all the steps below. Confirm your water quantities for the mash and sparge (if using one). For source water, you’ll need to click “configure” the first time and enter your numbers from your water report and save a profile. Here’s what the above report looks like in Brewers Friend. Select your target water profile. For an IPA, choose the Light Colored and Hoppy profile. In the Salt additions section, you’ll have to play with the different additions to get numbers in the “Total Water” section that are close to your target. You can scroll back up and look at the target water section to see how close you are. This just takes some practice, and as of this post there’s no automated way to calculate what to add. Use grams as the value, that way you can just adjust your total volume of water at once and not worry about dividing things. Alternately, check the “Salts Added to Mash Only” box and add all of your salts just to the mash. This is my current method. Once your minerals are in order, scroll down to the Acid Additions section and check both boxes, and then select Lactic Acid. Mash pH of 5.4 is a good target for most beers. Exceptions I have found are a lower pH for Saisons and a higher pH for wheat beers. The generally accepted range is 5.2-5.6. So, 5.2 for Saison and 5.6 for wheat. When in doubt, go for 5.4, but feel free to experiment. This will automatically calculate how much lactic to add to get to the target mash pH. You can verify this with a pH meter, but that’s expensive and Brewer’s Friend is accurate enough that it will improve your beer even if it isn’t bang on. Now go to the Sparge Water Acidification section and select Lactic Acid and check the box. You’ll see how much acid to add to your sparge water there. Verify that your grist is right and pulled over properly, then save the report and you’re ready to brew. Measure out your acids and salts and add when appropriate. Add salts and acids before beginning the affected brewing step. In other words, add the salts and acid to the mash water and dissolve well before mashing in. Same for the sparge. That’s it! Enjoy even more delicious homebrew now that you are adjusting your water for less than $60 total. Great article. I have been using bru’n water for my last brews but it is interesting to see other ways of doing it. I would recommend using Bru’nwater to calculate your adjustment. I’ve tried Bru’n water, but I find it cumbersome and a little difficult to use. Brewer’s Friend is based on many of the same formulas, has similar accuracy, and I find it easier to use. Thanks for the comment Denny! Why are all these elements and chemicals ions? I’m not sure exactly what you are asking, but maybe the wikipedia entry on ions would be helpful? : https://en.wikipedia.org/wiki/Ion I’m not a chemist, so any attempt I would make to explain ions would almost certainly be inaccurate.